Professional equipment should be manufactured in accordance with the standards determining its permissible scope of application. The standard adopted in Europe for measuring devices and accessories as well as for laboratory devices and automation systems is EN 61010. The latest version of the EN 61010-1 standard, that defines the safety requirements for electrical measuring devices, automation systems, laboratory devices, and accessories offered for them, dates back to 2011. It superseded the regulations established in 1999 and 2004. The original version of this standard - IEC 61010-1 – was developed by International Electrotechnical Commission (IEC). It constitutes a basis for national regulations in the USA, Europe, and in Poland. The EN61010-1 standard is based on the above-mentioned guidelines, that is why its contents and requirements are compliant with the standards applied worldwide. People who want to buy a measuring device should focus on the first part of the PN-EN 61010 standard. The standard also includes specific requirements for testing and measuring circuits. They focus not only on measuring devices, but also on their environment. It should be noted that the EN 61010-1 standard refers to low voltage equipment that is designed to operate with voltages below 1000V. Safety categories constitute an important part of the EN 61010-1 standard. They refer mainly to the distance separating a measuring device from source of energy. In case of longer distances, we can safely use devices compliant with requirements specified for lower safety category, due to the fact that the risk of overvoltage is lower. CAT I may only be used to test electronic devices, i.e. low energy equipment. CAT II may also be used to test single-phase energy receivers, i.e. consumer electrical equipment, low-power industrial equipment, and portable tools/devices. outlets without protection located more than 20m away from CAT IV sources. Devices that meet requirements of CAT III give more flexibility as far as safe operation is concerned. They can be used in three-phase and one-phase networks, to test switchboards and lighting circuits (also industrial ones). These devices can be used to make electrical measurements inside the buildings that are not distribution stations. They are suitable for any works performed in industrial plants and residential buildings. They can be used to test switching appliances, multiphase motors, or even mains and power lines in factories. The highest CAT IV category allows to test three-phase voltage circuits on utility power connections as well as to test cables outside the buildings. overhead and underground electric lines provided that the above-mentioned elements are low voltage installations. Apart from specifying a safety category for a particular device, a manufacturer should also provide its voltage range for a given category. It is connected with the way devices are tested depending on the safety category and specified max. operating voltage. There are five different values for operating voltage (DC or RMS): 50V, 150V, 300V, 600V, and 1000V. 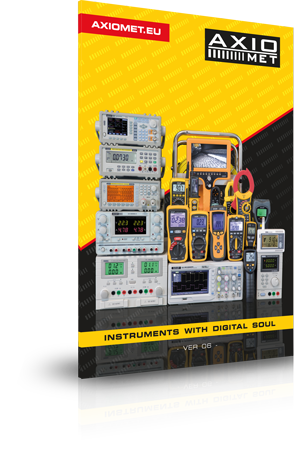 However, most of measuring devices are designed and tested for voltages of 600V and 1000V. A device meets the requirements of a particular category for a given operating voltage if it passed voltage tests. Parameters of these tests for voltages of 600V and 1000V are shown in table 1. As it can be seen, the higher the category, the higher is the voltage of peak impulse and the lower is the resistance of the source for the same operating voltages. While making a decision concerning measuring devices or accessories, it is important to take into account the voltage that will be measured with the use of such devices or accessories as well as conditions in which such devices or accessories will be used. It should also be remembered that accessories should have at least the same safety category as the measuring device has. CAT III and CAT IV devices are the most universal ones. These categories can be used to perform most of the works connected with electricity and electronics. However, CAT IV devices are usually slightly more expensive than CAT III devices. In order to use measuring devices safely, it is extremely important to choose appropriate equipment suitable for intended applications.